Although none of the shops display sign boards, the proprietors of some of the shops on Dale Road at the time this photograph was taken are known. The first shop on the right, with the young boy outside it and with paintings displayed on the walls inside the window, was the studio of the artist and photographer William Nathan Statham. Attracting considerably more attention from passers by was Gessey's confectionery next door. 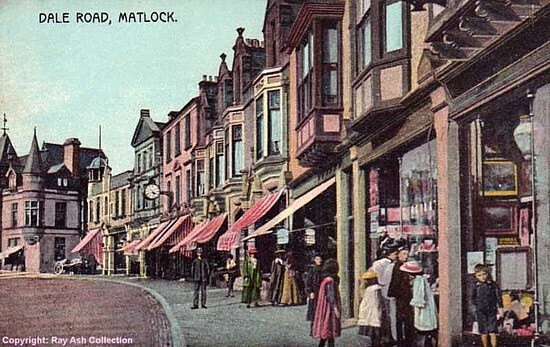 The family had arrived in Matlock before the 1901 census and Mr. Gessey senior opened a confectioners on Smedley Street. His son, Walter Ernest, ran the Dale Road shop. It might even be Mr. Gessey junior standing in the shop doorway, observing the women and children. The third shop along was Holmes' furniture shop; Walter Holmes was a skilled cabinet maker. At first we thought there was a name above the shop's window but closer examination is disappointing as the viewer can only see the shadow made by the supports underneath the bay window. Fourth along was the drapery of Elizabeth Eaton, with Kirkland's plumbers next and then the premises of Freeman Rice, a grocer and provision dealer. Then was was Goodson's Chemist's, next door to Evans' jewellers (where the clock is). All these shopkeepers lived above their shop premises. At the corner, outside Hunter's, is a delivery dray with a single barrel on it, but it is unclear what is being delivered. "Dale Road, Matlock". No publisher and not posted, but printed in Bavaria. Another version of this card was posted in 1904. The card was still in circulation after the First World War. Postcard in the collection of, kindly provided for this website by and © Ray Ash.